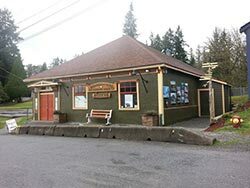 Chemainus is itself almost a living museum, it unashamedly displays it`s history on the walls of the town and has become a major tourist attraction on Vancouver Island. It also has a small museum in Waterwheel Park which has many interesting artifacts on display. Of note are items attributed to Bob Swanson during his tenure as mill engineer. Mr. Swanson was famous for his work on air horns, for example, the horns atop the old B.C. Hydro building in Vancouver that play O'Canada at noon. He was also the major moving force behind the refurbishing of the Royal Hudson locomotive that now hauls excursions to Squamish from West Vancouver. 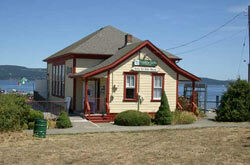 Crofton has a small museum on the water front which covers mining and forestry in the local area. The section on the Crofton school is interesting. A young junior teacher is shown in class pictures in his early days, subsequent pictures through the years show him growing older until he reaches the position of principal. 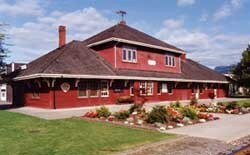 Just to the north of Duncan, approximately 15 Km south of Chemainus on the Island Highway, is the home of the B.C. Forestry Museum. This is an extensive display covering several acres of wooded land and boasts its own working logging road. The main power for this operation is a refurbished Shay locomotive. The work on this engine was done in the museum's extensive workshops and carried out by volunteers who are retired professionals and talented employees with many years of experience. 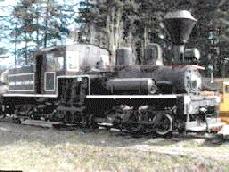 (The locomotive now running on the Kettle Valley rails at Penticton was rebuilt at this facility.) Besides locomotives, there are many other pieces of early forestry equipment, including a Ruston steam road roller in full working order and looking "like the day it left the factory" in England. The Native Heritage Centre celebrates the history of the First Nations people of the area. Wood carvers and painters work in the centre on canoes, totem poles and smaller works of art. There are displays of traditional Cowichan sweaters; and ladies spinning and knitting these world famous garments. Everyone here is pleased to answer your questions and show you their work. A magnificent gift shop at the entrance is a must see. 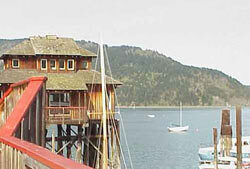 Cowichan Bay has an interesting Marine museum, housed on a pier extending out into the bay. Exhibits are in buildings spaced at intervals along the pier, which enhances the sense of connection to the sea. The many restaurants, boat builders and chandlers adjacent to the museum add to the whole atmosphere. Rich display of articles and furnishings from the 1900's of Gold-diggers, Gamblers and Ghosts. A restored hotel moved from its original location in Wellington, near modern-day Nanaimo. Shawnigan Lake Museum - It’s bigger than it looks! Shawnigan Lake has an engaging history and it is home to the Kinsol Trestle. Stop at the museum on your way to the trestle to learn about its history and rehabilitation. The museum displays represent the history of Shawnigan as both a recreation destination and as a logging and mill area. Many famous people are woven into our history, including E.J. Hughes. Come and check out a special E.J. Hughes gallery within the museum. It is lots of fun for the whole family!